Spring is almost here! We can't believe how time seems to keep on flying by!! Charles' first event in January of 2019 started at Ocean Reef Paint Out in Key Largo, FL. It was a great event and a great start to the year! Oil Painters of America brought their "Virtuosos of OPA" to St. Augustine this February. Charles participated and exhibited in the showing of the plein air event. March 4-10, 2019 Wekiva Paint Out is hosting their yearly event at Wekiva Island near Orlando. The artist are there now so plan to visit this weekend. Visit Wekiva Paint Out for more information. Charles is looking forward to returning to Easton, MD for Plein Air Easton from July 14-21,2019. He can't wait to get back to paint this vast landscape! Plein Air Easton will have all the details. Charles had a great one man exhibition during the February Beaches Fine Art Series in Jacksonville Beach, FL. We will update as soon as we confirm more exciting events. Don't forget to check out Ocean Art Gallery and if you are in Ormond Beach stop by to see Charles' latest work. Here we are six months later again! Wow! Time is still flying. Charles has some new shows and event we will now share with you. January 2019 starts the new paint out season at Ocean Reef. Details to come. In February, Charles will travel to the Florida Keys to be a part of Florida Keys Plein Air Paint Out 2019 (Feb. 10-16,2019). More details to come. Charles has more news to share later! We hope to see you soon! Don't forget to check out Ocean Art Gallery if you are in Ormond Beach to see Charles' latest. Here we are almost six months later! Wow! Time flies. Charles has been very busy and has some new shows and event we will now share with you. Charles is one of a wonderful group of artists chosen to participate in the first "The Art of Conservation" event. White Oak Conservation Foundation has partnered with Arbus magazine for a unique event that explores the connection between conservation and the arts. For more information please visit Art of Conservation for more details. Next, Charles is honored to be one of 13 Florida artists invited to participate in an exhibit held at the Ocean Art Gallery in Flagler Beach titled, "Fabulous Florida." More details available at Ocean Art Gallery . Charles has been invited to and participated in Forgotten Coast en Plein Air all 13 years(well, this May will be the 13th). He cannot express how important this event has been to him and how grateful he is to be a part of this plein air family and event. He's honored to paint among these talented artists and be able to contribute to the conservation of this wonderful landscape. This year the event is from May 3-14, 2018. They have a wonderful website with all you need to know and all the artwork so visit Forgotten Coast en Plein Air 2018 Check out the events page and scroll all the way to the bottom to check out Plein Air South an event right after Forgotten Coast en Plein Air that you may be interested in. Come visit. You'll be glad you did! Charles was juried into the 3rd Annual Bucks County Plein Air Festival Jun 4-9, 2018 in Pennsylvania. He is looking forward to returning to the area to paint. Bucks County Plein Air Festival is a good place to check out all the details. Charles is excited to return to Plein Air Richmond 2018 this June 17-24th. The details can be found on the Website so check it out and see what you don't want to miss. Please visit Cashiers Plein Air Festival to see what Charles will be doing in July. From July 16-21, 2018 Charles returns to Cashiers, NC to paint the beautiful landscape there. It's an exciting summer! Charles participates in New Smryna Beach Paint Out October 8-14,2017. Please visit their website for updates. He is very excited to announce he was juried into 2017 OPA Eastern Regional Exhibition in Saint Simons Island, GA to be hosted by Anderson Fine Art Gallery from November 17- December 16, 2017. Visit the gallery website here to learn more about the gallery and view the work in the OPA exhibit. You can also visit Oil Painters of America's website for details and opportunities. Excited to let you know that Charles was awarded Second Prize for his painting "Shockoe Bottom Fire Escape" from Editor-in-Chief of Fine Art Connoisseur magazine during Plein Air Richmond 2017. Charles is having a great time painting Richmond,VA during Plein Air Richmond and will be there until June 25 2017. Stop by and see what they have to offer if you are in the area. Check the Plein Air Richmond website for details. We are truly excited to be returning to Paint Maine! This will be Charles' ninth year being invited to Southwest Harbor to paint and exhibit at Salty Dog Gallery. Charles and his work can be seen throughout the month of August. Visit Salty Dog Gallery to see news about the gallery! In October after traveling North during the summer, Charles participates in Canaveral Seashore Paint Out. Visit their website for updates. Happy New Year! New 2017 Award announcement! Congratulations to Charles for being awarded the Emmett Fritz Award for Best Oil Painting for his painting "Hanover Industrial Park" in the Honors Show in St. Augustine, FL. Charles is happy to announce that Peter O'Neill has invited Charles to exhibit in his new Key West gallery. They have been friends for over 20 years and Peter and his wife have exhibited Charles' work in one of their four galleries that entire time. Visit Peter O'Neill Gallery, Key West to see the new gallery. Charles had a great time participating in the Paradise Paint Out in January. This year the event benefited Florida Keys Children's Shelter. He was also invited to participate in the Ocean Reef Art League Event. These were great causes and great art events. He also painted at the Wekiva Paint Out in February and March. It was a great week painting a beautiful landscape. Check out Wekiva Paint Out for information. Charles was invited back to Winter Park Paint Out and is excited to get back to this area to see what he can create. To check details and to view the work at Winter Park Paint Out from April 23-29, 2017. This event is held at the Albin Polasek Museum and Sculpture Garden which is a beautiful setting for artists to paint as well as the public to enjoy! Charles was invited to Cashiers, NC in July from July 11-16, 2017 to celebrate their Joy Garden Tour event. Details to come soon. Please visit Cashiers Joy Garden Tour for details. It is a beautiful landscape to paint and record. Charles is happy to be juried into Plein Air Richmond from June 18-25 2017. Check the Plein Air Richmond website for details. Congratulations to Charles. His painting, "Reclamation" won First Place in the Honors exhibit in St. Augustine, FL. Charles returns to Cashiers, NC from July 12-16, 2016. Please visit Cashiers Plein Air Festival for all the details and artists participating. It is a beautiful landscape to paint and record. Salty Dog Gallery has invited Charles back for his 9th year to exhibit from August 1- September 2, 2016. He is excited to return and have the opportunity to paint this amazing landscape! Visit Salty Dog Gallery to see news about the gallery! We hope to see you soon at one of these great events or visit Charles at the Dow Museum which houses his studio when he is not on location! Congratulations to Charles. His painting, "Banyan Land" won Best of Show, Jean Wagner Troemel Award at the 2016 Spring Members Show. Thank you judge Ed Hall. 2016 Started with the Paradise Paint Out in Islamorada, FL. in the Keys. What a fun time he had there. February 28-March 6,2016 Charles painted around Longwood and Apopka during the Wekiva Paint Out 2016. This was the 10th year of the paint out and the 8th year hosted by Wekiva Island. It is always a special time. Check out Wekiva Paint Out for information. Charles has been invited back to Epcot for their annual Art in the Garden event in March. Come visit him in Epcot everyday from April 1-3, 2016. See artists at work and enjoy this beautiful park. Charles will be in Winter Park for the Winter Park Paint Out from April 24-May 1st, 2016.This event is held at the Albin Polasek Museum and Sculpture Garden which is a beautiful setting for artists to paint as well as the public to enjoy! Artists will be painting all around Winter Park and the museum. If you cannot make it to the event be sure to check the website out. May 6-15, 2016 marks the 11th year celebration of The Forgotten Coast en Plein Air paint out that invites artists to paint from Mexico Beach to Alligator Point in the Panhandle. Charles is always honored to be invited to this great event. They always have very special events to celebrate 11 years of plein air in the Forgotten Coast. It is not to be missed. Please visit 11th annual Florida's Forgotten Coast en Plein Air Invitational, America's Great Paint Out 2016 for all the details. Also check out Plein Air Florida which will take place May 16-19. Now is the time to sign up! Charles is looking forward to returning to Cashiers, NC from July 12-16, 2016. Please visit Cashiers Plein Air Festival for all the details and artists participating. It is a beautiful landscape to paint and record. In October after traveling North during the summer, Charles participates in Canaveral Seashore Paint Out. Excited that Charles won another award at the 2015 Lighthouse Art Center Paint Out. He thanks the judges, Morgan Samuel Price, Maisa Pascucci, and Glenn Tomlinson for this recognition. Charles is in Winter Park for the Winter Park Paint Out. This event is held at the Albin Polasek Museum and Sculpture Garden which is a beautiful setting for artists to paint as well as the public to enjoy! Artists will be painting all around Winter Park and the museum. If you cannot make it to the event be sure to check the website out to see the work and fall in love with a new painting that you can buy from the Museum over the phone! Check it out! Just a reminder that May 1-11, 2015 marks the 10 year celebration of The Forgotten Coast en Plein Air paint out that invites artists to paint from Mexico Beach to Alligator Point in the Panhandle. Charles is always honored to be invited to this great event. He has been a part of this event for all ten years and is excited to return to share this experience.They have planned some very special events to celebrate 10 years. It is not to be missed. Please visit 10th annual Florida's Forgotten Coast en Plein Air Invitational, America's Great Paint Out 2015 for all the details. In June Charles returns to the juried art event, the Finger Lakes Paint Out in Canandaigua, NY from June 10-14. He can't wait to get inspired by this landscape again. Visit the website for details. The Salty Dog Gallery will host Charles' work in Southwest Harbor, ME from July 31 to August 21, 2015. We are really excited to return to this beautiful area and have the chance to paint Maine again! Check out Salty Dog Gallery to see the gallery. Charles had a great time participating in the inaugural Paradise Paint Out on Islamorada, FL in the Florida Keys. He is excited that his painting "By the Pool" won "First Place" during the event quickdraw. Please visit Paradise Paint Out Website for all the details. From March 1-8,2015 Charles is painting in the Wekiva Paint Out. This is a great event that will give you a great opportunity to visit the Wekiva River and Wekiva Island and contribute to its conservation! It is a fun event for artists and visitors alike. Next on his schedule is another first. Lighthouse ArtCenter Plein Air Festival will take place from March 12-15,2015. Charles has family in the area so he is excited to be a part of this event. Charles has been invited back to Epcot for their annual Art in the Garden event in March. Come visit him in Epcot everyday from March 27-29. See artists at work and enjoy this beautiful park. A Brush With Nature is an event close to home. Charles will paint there from April 16-18, 2015. Visit their website A Brush With Nature for the details. Then he is very excited to be invited back to Winter Park for the Winter Park Paint Out. This event is held at the Albin Polasek Museum and Sculpture Garden which is a beautiful setting for artists to paint as well as the public to enjoy! Artists will be painting all around Winter Park and the museum. May 1-11, 2015 marks the 10 year celebration of The Forgotten Coast en Plein Air paint out that invites artists to paint from Mexico Beach to Alligator Point in the Panhandle. Charles is always honored to be invited to this great event. He has been a part of this event for all ten years and is excited to return to share this experience.They have planned some very special events to celebrate 10 years. It is not to be missed. Please visit 10th annual Florida's Forgotten Coast en Plein Air Invitational, America's Great Paint Out 2015 for all the details. Charles is looking forward to a busy 2015. He will have a show at the Peter O'Neill Gallery the end of 2014 or the beginning of 2015. We'll post the dates when they have been confirmed. Charles is excited to be invited to participate in the inaugural Paradise Paint Out on Islamorada, FL in the Florida Keys. He will be painting this beautiful landscape from January 12-16, 2015. Please visit Paradise Paint Out Website for all the details. From March 1-8,2015 you will find Charles at the Wekiva Paint Out. This is a great event that will give you a great opportunity to visit the Wekiva River and Wekiva Island and contribute to its conservation! It is a fun event for artists and visitors alike. Then he is very excited to return to Winter Park for the Winter Park Paint Out. This event is held at the Albin Polasek Museum and Sculpture Garden which is a beautiful setting for artists to paint as well as the public to enjoy! Artists will be painting all around Winter Park and the museum. 2014 has been busy so far. Charles's one-artist exhibit, "Works From My Travels," has been extended at the Dow Museum (149 Cordova St., St. Augustine, FL) so if you are visiting St. Augustine please stop by to see Charles's work and visit his studio. The museum is a treat too. St. Augustine's 2014 "Best of Show" award went to Charles this year for his beautiful painting "Afternoon Shadows at the Dow Museum." Charles is on his way to Richmond, VA and the Plein Air Richmond event from June 23-28th, 2014. Plein Air Richmond website has all the information for the next event Charles will paint in. He is excited to be back in Richmond to paint this great landscape. The next exciting event from July 13-19th, 2014 is Plein Air North Carolina in Cashiers, NC. Visit Charles's page for his info and the website. Charles is excited to be returning to Salty Dog Gallery in Southwest Harbor, ME for a show from August 17-31, 2014. Charles loves to paint Maine and is excited to be invited back for his sixth year! Check out Salty Dog Gallery to see the gallery. October 6-11, 2014 Charles has been invited to the Canaveral Seashore Paint Out. It is a beautiful part of Florida. Paint Out Website will have all the details. In early November Charles is looking forward to a weekend artist retreat at Fair Oaks in Florida hosted by artist Linda Blondheim. Visit her website to see her work and read her blog. Also in November Charles will paint in Tarpon Springs for their plein air event. He is looking forward to this event and will post more details later. We look forward to seeing you soon at one of these events or at the studio at the Dow Museum! 2013 was a very busy year and 2014 is starting off that way! Charles's one-artist exhibit, "Works From My Travels," has been extended until January 31, 2014. Charles was really happy to be invited to participate in the Melrose Bay Holiday Invitational Show that began November 2, 20133 and will end January 12, 2014. HURRY to Melrose, FL to see the show while there are a few days left! Visit Melrose Bay Art Gallery website for details. Next on the schedule is Wekiva Paint Out. Charles has been an invited artist to this event for all 8 years and really enjoys the area and looks forward to the comradery with fellow artists. It is a great event so try to visit! You will find details at the Wekiva Paint Out website . From April 20-27 you will find Charles at the Winter Park Paint Out! Charles is thrilled to be invited back this year. This event is held at the Albin Polasek Museum and Sculpture Garden which is a beautiful setting for artists to paint as well as the public to enjoy! Artists will be painting all around Winter Park and the museum. Charles feels a specialness about this event and is so pleased to be participating again in 2014 Please visit the Winter Park Paint Out website for all the details and artists. You will definitely want to mark your calendars for this next event. Charles has been fortunate enough to be invited to participate in the 9th annual Florida's Forgotten Coast Plein Air Invitational, America's Great Paint Out 2014 or his 9th year! The organizers, volunteers, hosts, and collectors have all become like family to him so he looks forward to returning. Charles is thrilled to have the opportunity to paint this great landscape. Come see it through your own eyes and then see how the artists interpret this wonderful part of Florida. Visit the website to see all that is happening for this two week event! Once Summer hits Charles will head north to North Carolina for the biennial event Plein Air North Carolina held in beautiful Cashiers, NC in July. More details to come but if you have never been to Cashiers and the surrounding area this event is the time to visit! Charles had a great time at all his events so far this summer (Plein Air Richmond, Plein Air Easton, and Easels in Frederick quick draw event. NEW EVENT! August 6-11, 2013 Charles is headed to New Hope, PA and Local Color Weekend hosted by Bucks County Gallery in New Hope, PA. This is Charles's first trip to paint in this part of PA and he is very excited to have been added to the list of participating artists. If you live close, please stop by to check out the art and the artists! Don't forget that Charles' show at Salty Dog Gallery in Southwest Harbor, Maine this year starts on September 2nd and will close on the 15th. An artist's reception will be held on Tuesday September 3rd. Please check the link for details. Charles has added a few new events to his schedule this summer. Plein Air Richmond runs from June 10,2013 to the 16th. This is Charles' first time painting in Richmond so he is very excited about this event. If you are in the area please check it out! Charles will head back to Easton, MD for Plein Air Easton in July from the 15th through the 21st. He is very happy to return to this beautiful area. Please check the website for full details. Since he will be visiting family in PA in June he will stop by Frederick, MD to participate in the Easels in Frederick quick draw event for the fun and challenge of painting a quick two hour sketch and visit friends. Charles' show at Salty Dog Gallery in Southwest Harbor, Maine this year starts on September 2nd and will close on the 15th. An artist's reception will be held on Tuesday September 3rd. Please check the link for details. Charles has been fortunate and honored to win a few awards this year already. First he won "First Place" in the St. Augustine Figure and Portrait Show. Then in February he won "Best of Show" in the Tioga Winter Arts Fair in Gainesville, FL. And most recently he won "First Place" in the St. Augustine Members Show. Now just a reminder about upcoming events this spring. He heads to Ft. Pierce's Souvenirs of Downtown Plein Air Paint Out April 17th-18th. Next Charles is excited to return to The Winter Park Paint Out. There are many opportunities to watch artists work, listen to demonstrations, and enjoy the Polasek Museum and Sculpture Garden. Charles feels very fortunate to paint his eighth year in the 8th annual Florida's Forgotten Coast Plein Air Invitational, America's Great Paint Out 2013. This event is from May 2-12 so you have plenty of time to visit and check out all the wonderful events the Forgotten Coast Cultural Coalition have planned. There are opportunities to watch artists work, attend workshops, watch demonstrations, participate in talks, children's activities, music, and great food and parties. There are many opportunities to support this great organization and the artists who have fallen in love with this landscape! Please visit the website for complete details and plan a visit! Happy New Year! Charles has had a very busy Summer and Fall and looks forward to a busy 2013. Charles had a great time painting from North Carolina to Maine to Vermont last summer. Then he returned to paint in the Canaveral Seashore Paint Out in October 2012 where he gave a workshop to share his method of painting boats, a subject he loves to paint! Charles won a couple of awards during these events and his first award for 2013 at the St. Augustine Figure Exhibit this month. Charles' painting, Joe Taylor Painting, was awarded "First Place" in the 2013 Figure Show. During the summer of 2012 he was awarded "Second Place Award" for his painting, Honeymoon Cottage, at Plein Air North Carolina in Cashiers, NC. And then at the Plein Air Vermont event his painting, Through the Trees, was awarded "People's Choice Award." Charles had a great time painting at these events and is thrilled to be recognized for theses works. "Deja Nu / Deja Vu is the first major event of 2013. This exhibit features Charles' new work from his travels and a few of his favorites from previous events. He is exhibiting with artist Debbie Boon. This exhibit runs from January 1- February 27, 2013 at the Spear Gallery at the Dow Museum, 149 Cordova St., St. Augustine, FL. There will be a second artist reception on Friday February 1, 2013 from 5-9. Stop by if you are in the area. Tioga Art Show in Gainesville is from February 15- February 17. If you are in the area please call or email us for details. Then Charles is off to Wekiva Paint Out at Wekiva Island and the Wekiva River in Apopka, FL. This is a wonderful event with a wonderful benefit to the environment so please mark your calendars and try to visit. It is great fun. Charles is back at Open Air Arts again this year from March 15-19. The event runs through the 23rd so make sure you check out all the work at the gala events that weekend. On the 20th of March Charles heads to A Brush With Nature. The following is some information from the website and you can visit the the website for directions and information on all the artists. 'Plein Air' Painting Invitational and Gala: On March 23, 2012, the Jacksonville Arboretum & Gardens will host 38 of Florida?s premier landscape artists who will paint in the Arboretum?s beautiful 120-acre outdoor setting. Visitors can watch artists painting; attend artists? demonstrations and lectures; enjoy live music and food offerings; and watch children being taught to paint ?en plein air?. From April 5-7, 2013 you will find Charles in Italy. Well, Italy at Epcot during the Flower and Garden/Art in the Garden Weekend. What a beautiful setting to work. Plan a trip to Epcot to watch 16 invited artists paint these beautiful gardens and enjoy all that Epcot has to offer! Next stop... Fort Pierce, FL for the Souvenirs of Downtown Plein Air Paint Out. This is a short but sweet event starting on April 17th and running until April 19th, 2013. Come watch artists create work of the Ft. Pierce area and visit the 2 free public Art Receptions Thursday and Firday April 18 and 19th from 5-8 at the Backus House, 122 A.E. Backus Ave., Fort Pierce, FL 34950. Visit the website or call (772) 466-3880 for more details. April 21-28,2013 Charles will be in Winter Park,FL participating in the The Winter Park Paint Out. This is a beautiful area of central Florida and the event is held at the beautiful Albin Polasek Museum and Sculpture Gardens. Please mark your calendars and check the website for all the exciting details! Charles' last Florida event for the Spring is 8th annual Florida's Forgotten Coast Plein Air Invitational, America's Great Paint Out 2013. This will be Charles' eighth great year of painting the Forgotten coast. The Forgotten Coast is truly a beautiful part of the county. Please plan a trip to watch all the great artists paint and enjoy all the activities and landscapes this area has to offer! We begin the summer cycle of paint outs this month. Charles is off to Plein Air North Carolina, in Cashiers, NC from July 15-21, 2012. Mark your calendars and come watch artists work. Check the website for details. Cashiers is a beautiful part of the country with some of the bests plein air artist so try to make it by to see art being created. Next we head to Maine. We have a week of painting the Maine landscape with fellow artists and then we are excited to be returning to Southwest Harbor and Salty Dog Gallery. 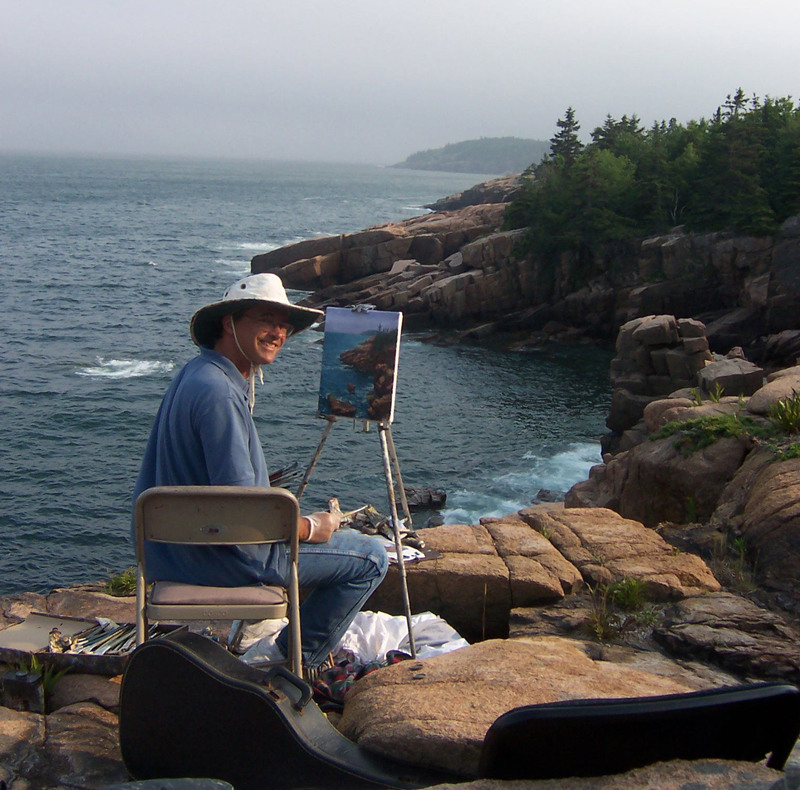 Charles will again spend two weeks painting Mount Desert Island. Stop by the gallery each day to view his paintings from past years as well as the new work as he paints it from August 5th-18th. There will be a three-artist reception on Thursday August 9th with Charles, Phil Steel, and Julie Spahr. Plein Air Vermont is the next event from September 4-9, 2012. Charles is excited to be back in Vermont and to have the opportunity to paint the Vermont landscape once again! If you are near North Bennington please stop by. We certainly hope to see you at one of these events! Charles is already into his Paint Out season which is really all year long! Here's an update. Next stop... Fort Pierce, FL for the Souvenirs of Downtown Plein Air Paint Out. This is a short but sweet event starting on April 18th until April 20th, 2012. Come watch artists create work of the Ft. Pierce and visit the 2 free public Art Receptions Thursday and Firday April 19 and 20th from 5-8 at the Backus House, 122 A.E. Backus Ave., Fort Pierce, FL 34950. Visit the website or call (772) 466-3880 for more details. April 21-29,2012 Charles will be in Winter Park,FL participating in the The Winter Park Paint Out. This is a beautiful area of central Florida and the event is held at the beautiful Albin Polasek Museum and Sculpture Gardens. Please mark your calendars and check the website for all the exciting details! There are many opportunities to watch artists work, participate in free painting demonstrations, and collect beautiful plein air artwork that will support art and the museum. Some details follow. Patrons and Spon?sors Pre?view Recep?tion Sat?ur?day April 28?5:00 PM to 6:00 PM Paint Out Patrons and Spon?sors gather for an exclu?sive pre?view of Win?ter Park Paint Out art?work. Join us for a pri?vate recep?tion with the artists and first choice of paint?ings deliv?ered Sat?ur?day before the Gar?den Party sale. Please con?tact the Polasek Museum at (407) 6476294 for more infor?ma?tion about becom?ing a Paint Out Patron or Spon?sor. Paint Out Gar?den Party Sat?ur?day April 28?6:00 PM to 9:00 PM Tick?ets $45.00 in advance, $60.00 at the door Join us for a spe?cial night ?en plein air? at the Polasek Museum. We?ll be cel?e?brat?ing the mas?ter?ful works of our paint out artists as we bring the 2012 Win?ter Park Paint Out to a close. Meet the artists from this year?s event and see the entire exhi?bi?tion. For ticket infor?ma?tion, click here or con?tact the Polasek Museum at (407) 6476294. Then we are really excited to return to Mexico Beach, FL and the 7th annual Florida's Forgotten Coast Plein Air Invitational, America's Great Paint Out 2012. Opportunities abound during this twelve day event! You can watch artists work, listen to art discussions, visit these wonderful landscapes, and collect wonderful plein air work that supports art and culture in the Panhandle of Florida. Visit the link above to get all the details of artists demos and receptions! Come join the fun! The Six Artists Six Prairies project had a successful showing at the ACT event in February. A future exhibit of the remaining paintings is pending for the summer of 2012 at Paynes Prairie. Charles is off to an event Plein Air North Carolina, in Cashiers, NC from July 15-21, 2012. This is a beautiful setting for creating wonderful landscape paintings. Mark your calendars and come watch artists work.Check the website for details. Charles is also excited to be invited back to Maine and Salty Dog Gallery. He will again spend two weeks painting Mount Desert Island. Stop by each day to view the new work as it is completed from August 5th-18th. There will be a three-artist exhibition on Thursday August 9th with Charles, Phil Steel, and Julie Spahr. Wow! How time flies! A new year is upon us and we have new events to tell you about. First an update on Charles's Six Artists Six Prairies project. The artist's paintings will be on display at Prairie Creek Lodge from February 18- March 16, 2012. The main event will be February 25, 2012 from Noon-9PM. The artists will be painting in front of the lodge from noon to dark, rotating artists throughout the day. Come meet the artists, watch them paint and purchase original framed paintings while enjoying hors d'ouvres and live music. The artist's paintings sales will support the efforts of Alachua Conservation Trust and their many educational and land acquisition projects. Charles is excited to announce that he is participating for his 7th year in the 7th annual Florida's Forgotten Coast Plein Air Invitational, America's Great Paint Out 2012. More than 20 nationally acclaimed artists will set up their easels and pull out their brushes to document the landscape and culture of this last vestige of authentic "Old Florida" ? the coastal stretch of scenic North Florida between Mexico Beach and Alligator Point May 3-13, 2012. Please visit their website for updates! In February Charles will be exhibiting work in Vero Beach. Details to follow. Wekiva Paint Out will be held March 5-11, 2012 in Longwood, Fl at Wekiva Island. Charles will give a workshop entitled "Painting Reflections" on his method for painting reflections in the water. $30 for three hours. Bring your paints and join in the fun. Visit the Wekiva Paint Out website for complete details. This is a fun and beautiful area. Please stop by to watch artists at work and help preserve this beautiful waterway. Follow the link for complete details. Charles heads to Epcot for their annual Art in the Garden event. Come visit him in France everyday from March 23-25, 2012. April 21-29,2012 Charles will be in Winter Park,FL participating in the The Winter Park Paint Out. This is a beautiful area of central Florida and the event is held at the beautiful Albin Polasek Museum and Sculpture Gardens. Please mark your calendars and check the website for all the exciting details! Charles has a few events pending and will let you know about those as soon as they are confirmed. We wish everybody a very great New Year and look forward to painting the landscape another year!